1. Welcome to Endress+Hauser, the People for Process Automation! For more than 60 years, our focus on customers has determined how we act. Whatever you are doing at the moment, Endress+Hauser is not far away. Whether you are drinking water or eating something, turning on the light or taking a pill, you are always surrounded by things manufactured with industrial process engineering. This is Endress+Hauser’s field of business. Endress+Hauser is a leading global provider of process and laboratory measurement technology, automation solutions and services. We help our customers to operate their process applications and plants safely, reliably, efficiently and in an eco-friendly way. Endress+Hauser is a family company. For our customers, we act as a global partner who can be relied upon around-the-clock and around the world. The majority of our earnings flow back into the company, to enhance our global network and to develop new products. Company-owned sales centers and dedicated representatives bring our expertise to markets and customers around the world. They take care of local sales, services and engineering. Our five production centers are the knowledge hubs for their respective fields of activity. These entities are responsible for marketing, research and development and production. We produce in all major economic regions of the world. This allows us to quickly and flexibly supply our customers anywhere in the world. With our field devices, our customers acquire valuable knowledge from their processes. They measure physical parameters such as flow, level, pressure and temperature, analyze parameters such as pH values, oxygen content, turbidity and much more or determine density, concentration or composition of substances. Level Measurement: We offer an extensive selection of measurement principles for the continuous measurement of levels, interfaces and density as well as level limit detection. Flow Measurement: Our flow devices measure liquids, gases and steam in both small and large quantities. Pressure Measurement: We offer high-performance devices for measuring process pressure, differential pressure, fill level and flow. Liquid Analysis: Endress+Hauser offers a comprehensive portfolio for all parameters in liquid analysis. Advanced optical technologies are used in the gas analyzers as well as the Raman analyzers. Temperature Measurement: We are a full-range supplier of temperature measurement technology, including compact and modular thermometers, thermowells, measurement inserts, temperature transmitters and accessories. System products and data managers from Endress+Hauser supply energy to measurement devices and protect them from power surges. 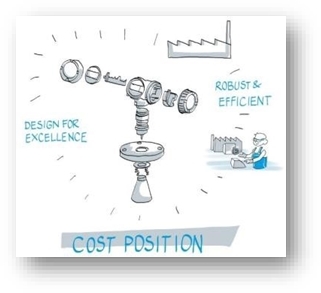 Endress+Hauser Maulburg is the biggest product center of the E+H Group. With more than 2000 associates we serve our customers out of nine locations all over the world, with our products. We stand for level and pressure measurement as well as for Inventory Management solutions. In these fields we offer configurable measurement transmitters to our customers in a huge variety of up to 33 million different variants of one dedicated product line with a lead time of two to five days. We want to improve our product related cost position and put it into the center of all our activities to be competitive on a long term. Beside the thrive on robust and efficient production processes we decided to put our major focus on the development of cost optimized products. The goal is to develop products which are easy to assemble out of cost optimized and prize optimized parts. It was pretty clear that DfMA is the preferred tool to fulfil this target. During a careful selection process on tools, methods and consulting companies, we ended up with a group of three possible suppliers which we evaluated furthermore. With each of them we had detailed discussions about their methodologies, software and support and tested their capability in a pilot project. The by far best supplier was BDI and its European representative amc. Together with amc / BDI we set up our implementation plan, our implementation framework and our organizational set up. Endress+Hauser decided to select one responsible coordinator who stands for the implementation of the DfMA Methodology, drives communication throughout the company about the benefit and who organizes the Workshops as well as the Training and the purchasing of the Software. Furthermore, there were four DfMA moderators selected together with eight DfM Specialists. Throughout the year 2017 we run through a well scheduled training program for the moderators as well as the DfM Specialists and performed several DfMA workshops together with amc´s support. Our major communication approach was not to cut cost in our organization and to release people. We focused on the optimization of our product cost by a better design by a team approach in development. Coming from a functional view of each single specialist involved in the development process of a product we promoted a holistic view on the product during a DfMA process going along with the development process to bring the knowledge of the many involved people into a new product. And we wanted to challenge the design of a new product from all disciplines of the value generation process of our company until the first designs were released for purchasing or production. In a first phase we adopted the proposed methodology of BDI for our DfMA workshops. Starting with a Pick-up Workshop where we generated the cost baseline as well as the product structure during disassembly of the first design, generated new ideas during reassembly and improved the ideas along the minimum parts criteria. To evaluate the benefit of all the many concurrent new ideas which were generated during disassembly and reassembly we decided to go for a methodology developed by amc which is called the delta evaluation. 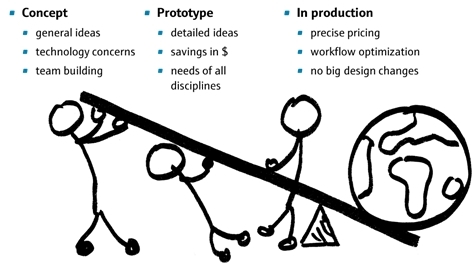 Here we evaluate the cost benefit of each new idea created in comparison to the basic design approach we started from. In an Excel form sheet provided by amc we were able to compare each new solution to other concurrent ideas and the original design in a transparent and traceable manner. This gives us not only to a very conclusive process, it also gives us the option to document and store good ideas for further reuse in future development projects. In combination with a thoroughly designed implementation plan, a stable organizational set up of key players and a good communication plan we gained a good success during the first year of implementation of DfMA in our organization. We did four DfMA- workshops in the first year where we jumped into already running projects and tried to optimize the design of the product according to the rules of DfMA. We had a decent success, but the real breakthrough came, when we started our DfMA Workshops at the very initial phase of a development project. Here we had much more freedom of ideas and could influence the project much more which ended up in a much higher amount of savings. Based on this experience we decided to make a DfMA workshop mandatory for each project which will be started at a very early phase directly connected to its official project release. The awareness and enthusiasm of the people related to DfMA in our company is also expressed by the number of good marks we gained for our DfMA Workshops. We got 76% positive, 23% good and only 2% negative feedback from 121 different participants of our workshops and a huge number of very positive comments. Even today after two years of DfMA Project Leaders are actively requesting DfMAs for each new product development which is to be started and people from throughout the company volunteer to participate in our DfMA Workshops. Meanwhile not only the Product Center Maulburg runs DfMA Workshops, also two of our four sister companies started to implement this methodology created and maintained by BDI / amc and have a huge success by this methodology. We are looking to harvest the success of DfMA during the next years, when all our new cost optimized products enter the market. Today we have already an estimated benefit of 1 million $ per year and with each new DfMA workshop, we continuously add further savings to this amount of money. This is also seen by our top management of the E+H Group and our Maulburg DfMA team won the E+H Process Innovation Award 2018 which is a big honor for the team and for BDI and amc as well. Thanks for the excellent tool training and support of BDI and amc.